Ubisoft's artistic action-RPG Child of Light has been drawing plenty of attention since its announcement last year, and yesterday's Nintendo Direct has treated us to yet another gorgeous trailer. There's plenty of gameplay brought to light as the young Princess Aurora battles, explores, and puzzles her way through the world of Lemuria. 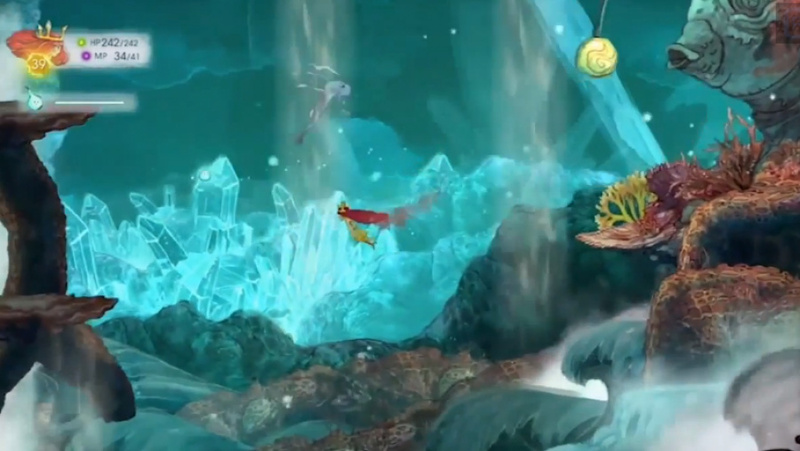 The trailer also focuses on her companion Igniculus, a firefly that can actually be controlled by a second player. Work together, and the guiding light can distract enemies, leave messages and heal your party. It's all looking pretty sumptuous, ready to launch on Wii U and other platforms on the 30th of April in North America, and the slightly altered date of 1st May in Europe. Are you burning to play this one? Or is it just a mere flicker on the horizon? Either way, let us know in a comment below. This looks lovely. I'm definitely eagerly anticipating the reviews for it. Utterly day one. Looks very special. @SanderEvers it's not delayed...may 1st is a thursday and that's when the PAL eShop gets updated. Simple as that. I know it's not anything like Rayman Legends... but I'm freaked by how much it's like Rayman Legends. Don't know if I could get past this fact to like it? Still looks like it will be too easy but I'm hoping otherwise. I'm really curious how this game will work out - the visuals seem rather promising! @MrGawain The game might be based on the UbiArt Framework, which was developed specifically for Rayman Origins and Legends. It looks so wonderful! But I don't like turn-based combat. I'm definitely going to pick this up on April 30th. Good thing I stocked up on eShop cards when Best Buy had them 20% off. I like turn based combat. I like real time combat as well. But this looks some what boring battle system. Hopefully there's something, that I don't yet see(actually, I am pretty hopeful). That was a fun, side-scrolling, action RPG with a female hero and beautiful hand-drawn artwork. This looks like the sort of game that appeals to Nintendo gamers and it will probably sell pretty well on Wii U. Maybe Ubisoft will get the message that Nintendo owners want innovative and visually interesting titles, not gimped ports of sequels to series that were popularized on other platforms. Zombi U ruined Ubisoft for me. No thanks. If I want a pretty RPG I will play Kingdom Hearts HD 1.5.